We simplified the battery cover door for the ACS processor. Our redesigned battery cover for the Avaya ACS cabinet is easy to install and less expensive than the original version. We use a conductive tape as the battery contacts. Insert your batteries into the cabinet slot then add the door. No need to insert the batteries into metal contacts like on the original battery cover door. The original Avaya 1151D1 Power Supply provides power to Avaya IP telephones when PoE (power over ether-net) is not compatible or PoE is not available. The 1151D1 is a brick type power transformer and our unique kit replaces that style with a more streamline wall transformer. The image above shows how to connect it to your Avaya IP phone. The Power Unit as it comes in the box. Warning: Do not over tighten the screw section of your PoE Kit. The ring will not screw all the way down the threads. If you force it, the unit will break. What do you do when one or both of the housing tabs that hold your adjustable LCD in place is broken? You can fix it with these replacement tabs. 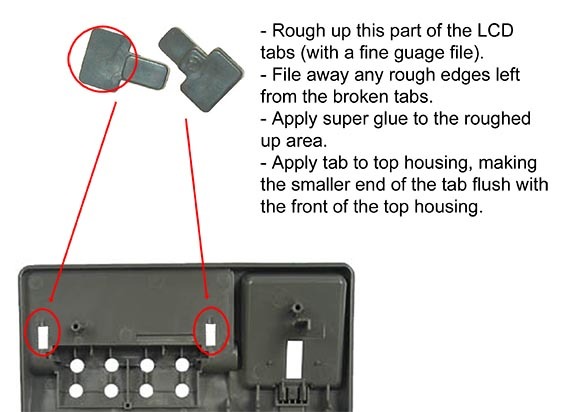 Instructions to get the proper fit are below as well as included with every purchase of these LCD replacement tabs. Test the application of the LCD tab BEFORE you apply the super glue. When properly installed, the new tab should be flush with the outside of the top housing. There are two buttonsets per package. We know that time is money so we developed a time saving button installation pack for the Avaya 2420 or 5420 and another one for the Avaya 4620,4621,4622,5620 and 5621. The spacing of the buttons in the blister pack is exactly the same as the placement of the button in the housing. You just insert the buttons through the inside of the top housing and press each one into place to release it from the foam carrier. Each buttonset comes two to a package and the installation instructions are printed on the package. There are two sets per package. Our time saving button installation pack for the Avaya 4620,4621,4622,5620 and 5621 helps keep your repair costs low by saving time on each repair. . The spacing of the buttons in the blister pack is exactly the same as the placement of the button in the housing. You just insert the buttons through the inside of the top housing and press each one into place to release it from the foam carrier. Each buttonset comes two to a package and the installation instructions are printed on the package. Our redesigned stand lock for the Nortel or Avaya 1120E and 1140E is extra long so that you can get your fingers between the telephone and it's base to easily push the lever and readjust your phone's position for your comfort level. No more broken nails or sore finger tips. This three piece label set will transform your global office phone to English. Just peel the backing and stick them over the icons. All printing is done on the reverse side, ensuring the words will never wear off. Translate those pesky icons on your Avaya Global icon phones to English with this twp piece durable translation sticker set. All printing is done on the reverse side so that the words will never wear off. Label is color matched to the phone to blend in.